On our visit to the MFA I stumbled upon Egyptian artifacts that were made and used for funeral ceremonies. In particular, 2 items (pictured below) stood out to me. Though these items were separated by almost 1,700 years, both exemplify how integral objects were to Ancient Egyptian funerary customs. A major aspect of these objects is the text; writings and symbols cover the majority of both objects and, in turn, give them extended meaning. Indeed, the writing gives the viewer further insight into the specified purpose of the objects, the type of people who would be associated with them, and an overall sense of how society used them to reinforce religion, family and the afterlife. In short, there is a distinct relationship between the functionality and textuality of these objects. The thickness of the two objects struck me as odd, considering their respective uses. The head plate was intended to be placed underneath the head of the deceased while the depressions in the oil tablet were used to hold the seven oils used during a funerary ritual. It would seem, then, that the plate would have needed to be thicker and more substantial in order to hold a human head, while the oil tablet would have needed to be more light and delicate so as to not spill the oils. In actuality, the plate was extremely thin and flat, while the tablet was bulky and hefty. This made me think of the different materials of the objects and what affordances they might have given, in terms of shape and size. The head plate was constructed of bronze while the oil tablet was constructed of Travertine, also known as Egyptian alabaster. Bronze is obviously a strong alloy which allowed the plate to be relatively thin, which might not have been the case if it was made of a sedimentary rock, such as Travertine. The bronze was also more rare and probably more sought after than Travertine, showing how important and sacred burial rituals were in this society. The material used also reflect the time in which they were made; while Travertine was primary used for the temple wall linings and other small objects in Early Dynastic times, Bronze became popular during and after the Bronze Age (3300–1200 BC in Egypt), showing early signs of a developing urban civilization. The objects were accompanied with what looked like hieroglyphics, covering the face of the object while the backs remained bare. The head plate was even inscribed with “the spell for providing heat under the head” from the Book of the Dead. The plate was dense with text while the oil tablet only consisted of the names of the seven different oils used during burial rituals. 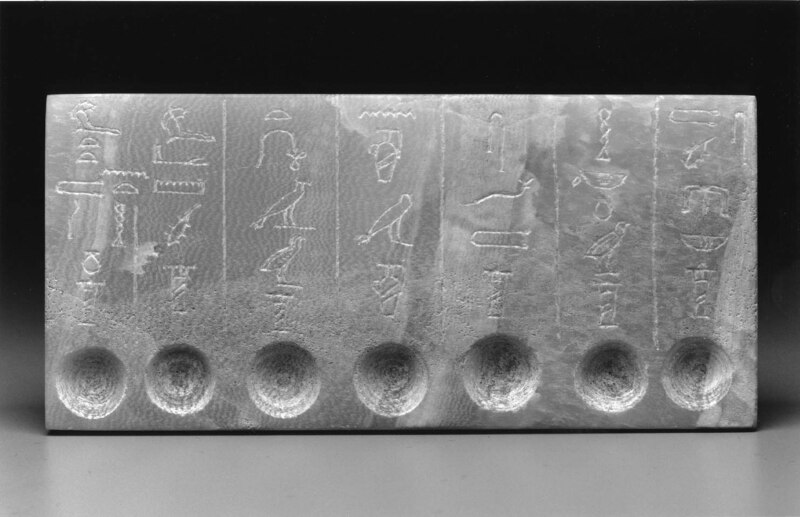 Perhaps, the amount of text is linked to how the object was used; the plate was physically placed in contact with the deceased as an act of good faith, while the tablet had a more straightforward, functional purpose. The tablet, therefore, did not require any text other than the names for the different oils. Nevertheless, the plagues describing the objects made it obvious that rebirth after death was a driving force behind many funeral practices, and no matter what the object was used for, it was used with care and respect. Though these objects of worship were obviously used with care, I was skeptical about who would have been associated with them. The plague below the head plate verified my suspicions, disclosing that they were found in the tomb of Djedhor, who was an ancient Egyptian pharaoh of the 30th Dynasty. It is unlikely that these objects were used frequently or for anyone who was not an important figure in society. These artifacts, therefore, have a sort of elitist element to them, valuable predominantly because they were associated with valuable people. The craftsmanship of these artifacts support this hypothesis; most ancient Egyptians couldn’t read or write and the scribing was mostly done by the priests. They could not have been made by everyone and were probably not made for everyone. While I conduct this analysis, I am aware of my own biases or inaccuracies; I am not sure exactly who made these artifacts, who would have used them, and even how to tell the difference between the different This is complicated further by the fact that in Egyptian writing “the bond with the spoken word was tenuous and, as Stephen Houston has pointed out, we do not know how the ancients read these documents, or if it is even appropriate to speak of reading in the sense that we understand it today. (Christopher Woods, Visible Language: The Earliest Writing Systems, p. 7) I agree that is difficult to speak or even think of reading/writing during the time when these artifacts were produced; I found it difficult to interpret the images as a way of writing, that was meant to be read and not simply viewed. I started to think about what new media came from artifacts like the head plate and realized that, although the writing style might have changed, the object itself is still very much alive today. Indeed, the use of headstones are still heavily integrated in our society. Even the name of the two textual objects are similar, both linking to religion and good faith in relation to the “head”. It is interesting, then, that I had such a difficult time accepting the representation of text on these objects, considering how seemingly familiar it would appear. I would agree with James Gleick when he says that new medium “transforms the nature of human thought.” (James Gleick, The Information: A History, a Theory, a Flood) I certainly had to think differently, interpreting the hieroglyphics as writing, in order to view these objects in a new light and accept them as textual materials.